Patti Townsend of Milburn is being recognized as a Significant Woman in Oklahoma Agriculture. She is shown here with her husband Gayland and three sons Philip, Charles and Steven. For Patti Townsend, her entire life could be described by these two words. After enduring the drought of the Dust Bowl, Townsend’s father, an Oklahoma farmer and coal miner, decided to move his family west to California during World War II. There was a need for work in the shipyards because of the war, so he was certain a better life would await them there. “My father just threw up his hands and said, ‘This farming is not worth it right now,’” she said. Townsend grew up in San Francisco, a much different sight from the New Mexico cattle ranches she would soon call home. After marrying Gayland Townsend, the two began ranching together in Albuquerque and then Roswell. They raised commercial cattle before incorporating Brangus into their herd, eventually owning nearly 800 head. The Townsends moved several times while in New Mexico, each time to a bigger ranch, before relocating to Oklahoma in 2004. “I was chief cook and bottle washer,” Patti Townsend laughed, pointing out that she worked more than everyone else because she had two jobs: ranching and cooking. She would have beans on the stove and cornbread in the oven while she worked cattle. While the Townsends ranched in Roswell on the “home place,” Patti Townsend became heavily involved with the New Mexico Cowbelles. She served on the board, as secretary and as president. “I did everything they asked me to,” she said. Townsend worked beef cook-offs, helped the New Mexico Beef Council – where she also chaired the board – at the state fair, and helped put on the beef ambassador contest. She traveled to each region of the state giving workshops, ran booths at the state capitol, and visited schools to teach children about beef cattle. She also led farm tours to show the public more about the industry. She recalls one lady being so excited – and scared – to give a cow a shot for the first time. “She did it. She ended up giving that cow a shot, and then she raised her hands up and just thought that was the greatest thing in the world that she gave that cow a shot,” Townsend laughed. It was the education and promotion of agriculture, specifically beef cattle, that drove Townsend. She was involved on the local, state and national level. She was named the 1999 New Mexico Cowbelle of the Year and served as president. She also served as region director of the American National CattleWomen for six years and was president of ANCW in 2003. Townsend, who “to this day still can’t believe it,” was named the 2011 ANCW Outstanding CattleWoman of the Year. “It was the best honor I could have in my life,” she said. The “home place” or “family ranch” as Patti Townsend calls it, is where the Townsends lived for about 21 years and raised three sons: Philip, Charles and Steven. It is also where Townsend started her sheep herd, which grew to nearly 600 head over a 20 year period. “There was a herd of them by the time we finished with them because they can have triplets,” she laughed. Her sons were all heavily involved in FFA, showing cattle, pigs and sheep. All three received their American FFA Degrees, and Charles was a state FFA officer. All three also grew up to pursue agriculture. Charles is a veterinarian, Philip is a rancher and fishermen’s guide, and Steven runs the ranch, which is now located in Milburn, Oklahoma. The Townsends moved to a bigger ranch outside of Roswell first before moving the cattle to Oklahoma. Why would a successful ranching family decide to move 500 miles to begin the challenge of raising cattle in a completely new state? The answer can be found in one word: drought. After year five of what would be an eight-year intense drought, the Townsends were at a crossroads. Their time in New Mexico had set them up for success in Oklahoma. As the ranches got bigger and more help came in the form of her sons, Patti Townsend wasn’t needed as much. However, she never got too far away from the ranch. “I stayed involved with the cattle, and when we culled cows and stuff like that my husband wanted me out there working to make sure I was satisfied with what they sent to the sale and what they kept for heifers. They didn’t sell my pets. Let me put it that way,” Townsend laughed. She became very involved with the Oklahoma CattleWomen and was slated to become an officer here too, before deciding she was needed more at home to take care of her husband after his heart attack. “I’m getting back involved with them again, but I am not moving up to be president so leave that off your list,” she laughed. She has truly loved the ranching life – where she spent her entire career – and is hopeful that her grandchildren and great-grandchildren will pursue it. 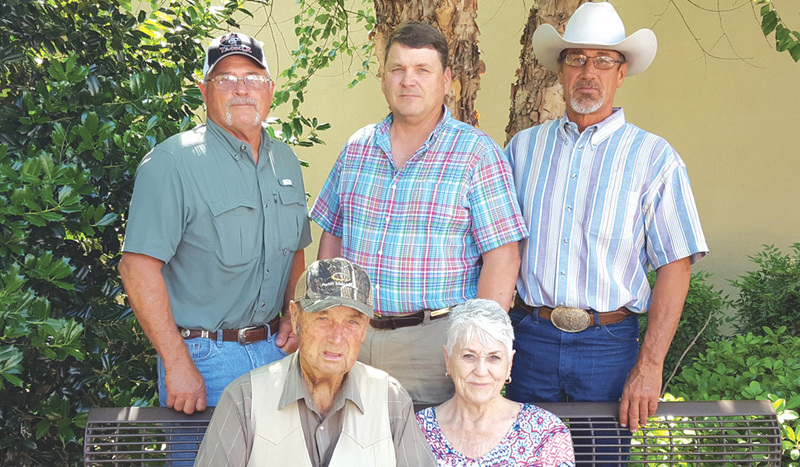 It has been almost 50 years since the Townsends first started ranching together. “It was fun days. I enjoyed it. I really did. It’s just something I did, and I was young enough to do it. Don’t ask me to now,” she laughed. Patti Townsend, now nearly 78, reflects back on her days on the home place and says every memory was great – whether it was good or bad. She would certainly love to be working underneath the Oklahoma sky.